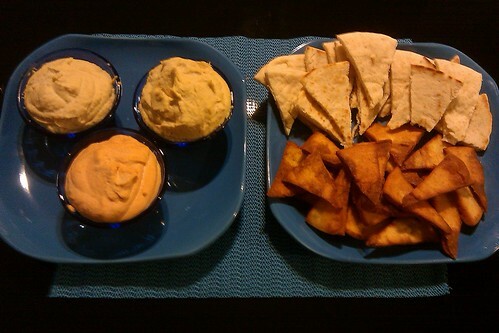 Garlic, artichoke and roasted red pepper hummus with pita wedges – Chef Tom Cooks ! Last Friday after work, Katie and I decided to make a batch of Hummus with pita bread. As we got to work we decided to add a couple twists to the standard recipe. We ended up with 3 different kinds of hummus along with fried and un-fried pita wedges. Combine all of the ingredients in a food processor and blend until smooth. If it is too thick, you can add a little extra water. 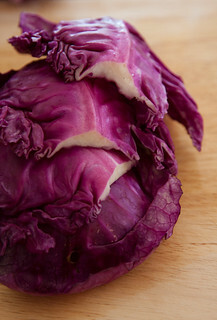 You can also add in artichokes or roasted red pepper for even more flavor. We made the whole batch and then divided it into 3. We then blended roasted red pepper into one and then the artichokes in another. We left the third one plain. To make the pita wedges, take a round pita and use a knife to cut them into wedges. Place half of the wedges on a serving dish. The other half, fry in oil for about 30-40 seconds on each side or until lightly browned. Let drain on paper towels and then add them to the serving dish. Carol Egbert - August 12th, 2010 at 8:20 am none Comment author #48715 on Garlic, artichoke and roasted red pepper hummus with pita wedges by Chef Tom Cooks ! A great snack or even dinner with a green salad. Adelina - August 12th, 2010 at 9:26 am none Comment author #48719 on Garlic, artichoke and roasted red pepper hummus with pita wedges by Chef Tom Cooks ! Nice idea! I love hummus and aritchokes. Which one did you prefer? admin - August 12th, 2010 at 9:41 am none Comment author #48720 on Garlic, artichoke and roasted red pepper hummus with pita wedges by Chef Tom Cooks ! I liked the artichoke hummus the best. Drick - August 14th, 2010 at 11:47 am none Comment author #48828 on Garlic, artichoke and roasted red pepper hummus with pita wedges by Chef Tom Cooks ! Kathy - August 16th, 2010 at 1:15 am none Comment author #48917 on Garlic, artichoke and roasted red pepper hummus with pita wedges by Chef Tom Cooks ! We have just recently rediscovered how wonderful Hummus is. I go through phases where I will buy it at the store to use as a primary snack. Then I get a little sick of it and quit for a while. But, recently while on vacation, some friends showed my how to make it myself so that I can control how much garlic and other ingredients get put into it. I never realized how easy it is to make it. So for now, I am back on the kick where I am eating it all of the time either with crackers or on a toasted Pita. Yum…..
Best Hamburger Recip - August 16th, 2010 at 9:46 pm none Comment author #48964 on Garlic, artichoke and roasted red pepper hummus with pita wedges by Chef Tom Cooks ! Denise - Family Cook - August 17th, 2010 at 5:37 am none Comment author #48986 on Garlic, artichoke and roasted red pepper hummus with pita wedges by Chef Tom Cooks ! I'm a big hummus fan. Hummus is so versatile and I enjoy coming up with all the combinations. Thanks for the ideas. Colin - August 19th, 2010 at 1:40 pm none Comment author #49133 on Garlic, artichoke and roasted red pepper hummus with pita wedges by Chef Tom Cooks ! Awesome recipe! Had tonight as an appetizer to Wild Salmon and wild rice…. the hummus was the perfect preface, and we'd been struggling to find a hummus recipe that came out as well as at our favorite Mediterranean restaurant. Thanks for sharing! Restaurant Supply Du - August 26th, 2010 at 10:01 am none Comment author #49534 on Garlic, artichoke and roasted red pepper hummus with pita wedges by Chef Tom Cooks ! This sounds great and very similar to a hummus that we do! I do want to mention though, that you can make a pretty awesome dip with many other kinds of beans too. We figured this out when we realized we didn't have chick peas on night. Security Jobs West V - July 9th, 2011 at 1:54 pm none Comment author #128739 on Garlic, artichoke and roasted red pepper hummus with pita wedges by Chef Tom Cooks ! I already knew about most of this, but having said that, I still think it is useful. Nice job! « How to make Spaghetti Squash?